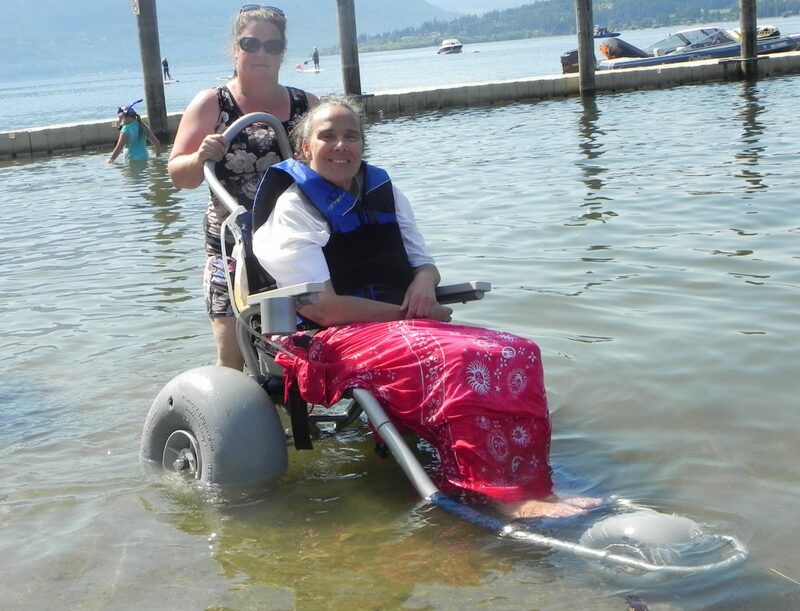 Enjoying a sunny day on a sandy beach, paddleboarding on a pristine lake with friends, and exploring the mountains in B.C.’s provincial parks are something Debra McDonald never thought she’d do again once she got her wheelchair. Diagnosed with multiple sclerosis (MS) in 1997, it took 13 years before the outdoor enthusiast from Revelstoke wound up in a wheelchair, changing her life forever. Losing her mobility was devastating, but McDonald was determined to continue living life to the fullest. McDonald made it her mission to acquire adaptive equipment for outdoor adventures, so in 2012 she founded the Shuswap TrailRider Adaptive Adventure Society, which is based in her hometown of Salmon Arm. 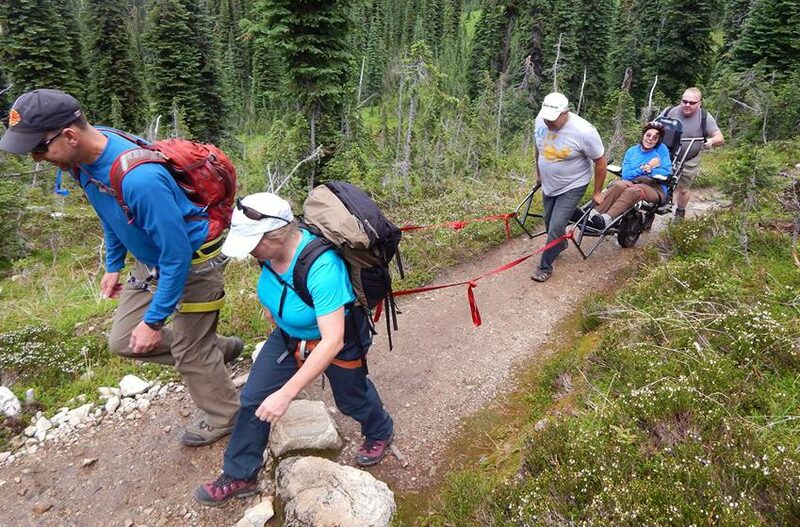 Through BC Parks, the Shuswap Trail Alliance, and donations from community organizations, the society purchased two TrailRiders – a lightweight, one-wheeled adaptable wheelchair that’s maneuvered by two to four volunteer porters and capable of handling rigorous backcountry trails. The TrailRider, which can be signed out by local residents or visitors to the area, has allowed McDonald to go up Mount Revelstoke, explore a number of regional trails and reconnect with her love for the great outdoors. It’s also allowed her to feel included among her friends and family. “It was a relief to get out of my wheelchair and just have people guide me along the trail, to laugh and just have fun with my friends again,” said McDonald about the first time she used the TrailRider. The society has since purchased a Sand Rider beach chair, which allows people with disabilities to go on sand and take a dip in the water – something McDonald hadn’t done in a decade. 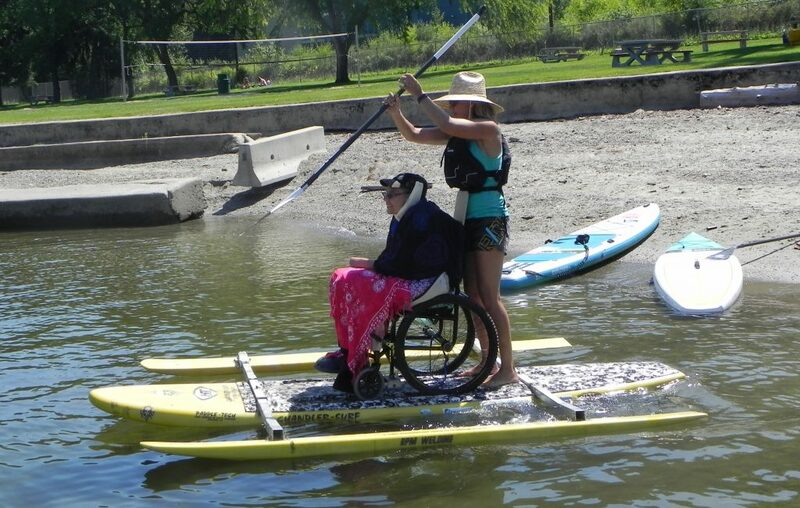 It also recently acquired an adaptive stand up paddleboard with funds from the BC Parks Licence Plate Program. McDonald has already used the paddleboard a number of times and said it feels incredible to be on the water. Seeing others with disabilities try the equipment for the first time sometimes makes her emotional. “It’s amazing to watch them. A lot of people who are disabled think they can’t do anything and we’re giving them the opportunity to step out there for a little adventure,” said McDonald, who’s thrilled to see the province making B.C.’s parks more accessible. The Strathcona Wilderness Society also has a TrailRider at Strathcona Provincial Park and the Caledonia Ramblers will soon have one for provincial parks in the Omineca region, thanks to funding from the BC Parks Licence Plate Program. Several other societies and groups throughout B.C. have TrailRiders available as well. BC Parks continues to expand access at popular locations for people of all ages and abilities. New campground developments also incorporate universal design standards and the first accessible playground was installed at Purden Lake Provincial Park in June.